No moving parts, no external power, solid aluminum construction, and full-speed 40gbps Thunderbolt 3 connectivity make this the ideal extension of the storage for your Thunderbolt 3-equipped workstations and laptops. 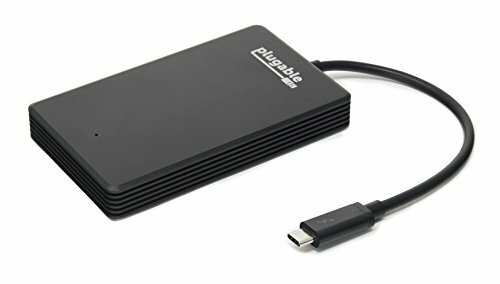 It works right out of the box, pre-formatted with exFAT (can be reformatted for use with other file systems) to make it compatibile and interchangable with any Thunderbolt 3-enabled Mac or Windows system. Directly import media into your favorite editing applications, and discover external storage the way it should be. Weighing only 6.2oz and with a minimal profile of 108mm x 65mm x 14.5mm it can be tucked in a pocket or bag without hassle. Includes a carrying bag to protect the anodized aluminum finish and keep your other devices safe from scratches on-the-go. Requires Thunderbolt 3-equipped USB-C interface. Does NOT support USB-C connections that do not feature Thunderbolt 3. macOS Sierra / Windows 7 and later supported. Boot Camp on Mac is NOT supported. 480GB external storage with PCIe Gen3 x4 link (formatted capacity and transfer speeds will vary depending on host system and workload. Host systems with PCIe x2 link will have reduced performance due to limited bandwidth). 480GB Thunderbolt 3 SSD with integrated 18cm/7″ 40Gbps Thunderbolt 3 cable, protective travel bag, quick start guide. If you have any questions about this product by Plugable, contact us by completing and submitting the form below. If you are looking for a specif part number, please include it with your message.